Location Well it’s on the Strip – just! It was the last resort on the Strip until Mandalay Bay came along to keep it company. There is a walkway to Mandalay Bay and the Excalibur, there is also a tram but it’s quicker to walk. You are a fair distance from the heart of the action; it’s about a 15 minute walk to New York New York and about 1 hour to Treasure Island right at the other end of the strip. 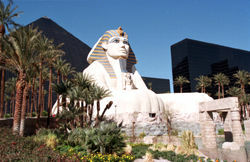 The location is not all doom and gloom; the Luxor is one of the closest hotels to the Airport so transfers are quick. Being almost the furthest South you can avoid much of the Strip traffic and get to the factory outlets in about 10 minutes. Theme Ancient Egypt and boy they carry this off really well, though sadly much of this theme is being lost as Luxor ups the stakes in becoming a cool hotel. Attractions Well its jackpot time, the Luxor put in an extra floor directly above the casino (attraction floor) and has dedicated it to non-gaming activities. There is a state of the art amusement arcade, a motion ride, IMAX cinema, theatre, King Tuts Tomb and museum. There is a food court as well as several small concessions and bars one of which serves foot long margaritas. Other than the bars this is great if you have kids they are allowed to roam here freely unlike almost all areas in all other resorts. We wasted many valuable gaming hours on the attraction level. Pool The pool is big and has a couple of waterfalls it’s not nice to look at but it doesn't seem to get too crowded and it serves its purpose well. There is an "ultra" pool area as well which commands an extra admission fee. Its not up there with MGM and Mandalay but streaks ahead of many others. Shows and Entertainment Luxor will soon have the hottest show in town Criss Angel Believe - by Cirque De Soleil but for now you have Carrot Top a very funny wacky comedian voted Las Vegas Entertainer of the year (over 18's) and the sexiest revue in Las Vegas Fantasy again only for Adults. There are also some excellent IMAX rides. Dining The Buffet was well themed; as a sort of archaeological dig site that was good fun. The food was varied, including a stir-fry Chinese that was cooked for you but the overall quality of the food was not as good as say the Aladdin, Bally's or Mandalay Bay though it is marginally cheaper (B:$11.99 L:$13.99 D:$19.99 champagne Sunday Brunch $17.99). The fresh fruit selection was very good but the deserts were not. . The food court at the Luxor is brill it has a great Nathan's Hotdogs as well as McDonalds, a pizza joint, salad and sandwich place, Ice Cream place and the amazing Luxor Coffee Company. These coffee stands are scattered all round the hotel and this is without question the best coffee in Vegas. The Luxor has several other "quality" restaurants including Isis which is supposedly one of the best in US we have not eaten at any of these so will not rate them. Luxor also has a 24 hour coffee shop that sells all types of fare 24/7. We only had coffee from here and it was filter and was, quite frankly, not up to much. The staff there also acted as if they were doing us a favour, they did not get tipped!! Gaming The Casino is huge; there is enough room to park 9 Jumbo jets here! It is quite light and has great mock Egyptian statutes when you enter. There are several sets of slot machines with either a Mercedes or a BMW in the centre that you can apparently win though I have never seen it and would like to see someone try to drive it off its oddly perched stand. The range of 25c slots is pretty good though they could do with a load more on nickel machines for cheapskates like me. There are about 70 tables from $5 minimum upwards though we found that the minimum stakes often went up when play was busy. The casino is actually surprisingly difficult to navigate and can disorientate you very easily. The Ra nightclub is attached to the casino floor, as this is the trendiest place in town you can often spot celebs walking across the floor, we saw Steve Tyler from Aerosmith. Free drinks are very slooooow in coming particularly when you are playing on nickel slots; unfortunately the same applies to change people and engineers when the hoppers empty or machine jams. This casino does not seem to get too crowded probably due to its location. Drinks service The drinks service was slow, we did not get served often and when we did we had to wait an age for then to arrive. If anything this seems to have got worse over the years there are load sof bars now and I am guessing that they want you to spend your money there rather than dishing out freebies. OverallA good value well packed resort with a great Spa, massive gaming area and large amount of non-gaming attractions not to mention the best coffee in Las Vegas, though its close now with Wynn and Mirage. Good points Check in is smooth, loads of parking and being in a pyramid is pretty cool. Top Tip You can not get the monorail to Mandalay Bay it only stops to let people get off, yuo can walk through the Mandalay Passage though which is far quicker anyway.